Made by Carroll, Alison (Windlass) in Ernabella, South Australia, Australia, 1995. 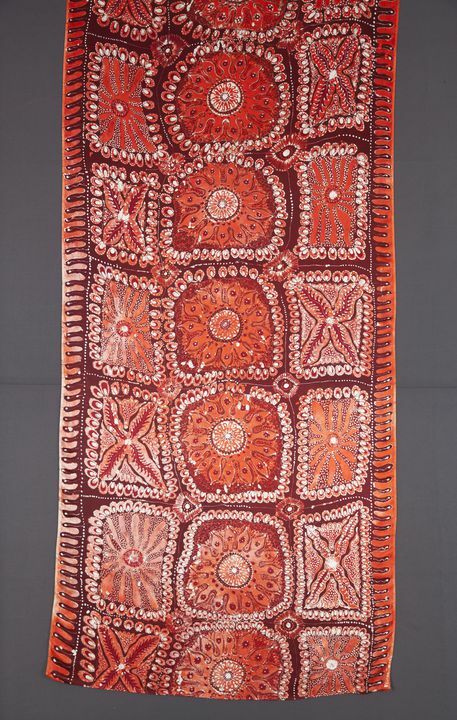 Textile length, batik, silk satin, napthol dyes, designed and made by Alison (Windlass) Carroll, Ernabella, South Australia, 1995. Batik on white silk satin, canting batik, grid pattern of large irregular rectangles, each containing an abstract variation of a flower or star-like form, each with further decoration within. Each rectangle divided by a fine dotted line, meeting at intersections in an elaborate 'flower'-shape. A frond-shaped border pattern along edges. Orange-red, deep-red, purple-brown on white. Signed at selvage 'Alison Carrol'. Ends unfinished. Workshop no: EB3291AC. Designed and made by Alison (Windlass) Carroll (born 1958) at Ernabella Arts workshop. Also known by her Pitjantjatjara name of Milyika, currently 'kunmanara' (unable to be used as someone with the same name has recently died). A younger artist, educated in Adelaide. Ernabella was a mission settlement (refer Winifred Hilliard's book, The People In Between), and from the 1940s crafts were taught to provide employment for people who had previously been nomadic. Weaving was one of the first crafts taught and batik was introduced in 1971 when Leo Brereton taught batik there. The abstract designs of the Pitjantjatjara people rarely have explicit meanings although it is thought they do relate to body and ground painting. This batik is unusual in its rectangular divisions, influenced by Alison Carroll's recent and enthusiastic introduction to printmaking processes like etching (Solarplate workshop, Patron Press, Adelaide with Dianne Longley Feb 1995). Made by Alison Carroll at Ernabella, using napthol azoic dyes. The lines are made using a canting. Selected from a number of batiks and screenprinted textiles offered during a visit to the Powerhouse Museum in October 1995.